"Cinders and Ashes!" Everyone's favourite steam train will puff into Emerald Town Station this Spring, and you are invited to meet him. 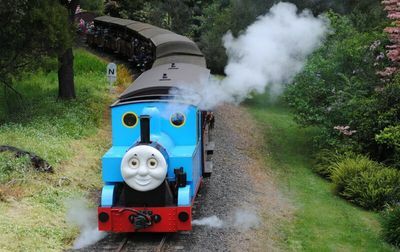 Thomas the Tank Engine will join Puffing Billy this October and November, attracting a truck-load of excited little kids and their families along to enjoy a fun-filled ride in the Dandenong Ranges. The Day Out With Thomas will see Thomas and his adjoining carriages pulled along the tracks by his best train-mate Diesel, allowing visitors young and old to climb aboard the world famous choo-choo to travel through Victoria's spectacular tall forest scenery for a 20 minute ride. If that isn't enough fun to "bust your boiler!" there will be non-stop locomotive enjoyment back at Emerald Town Station, with a pantomime show featuring Thomas and the Fat Controller, as well as face painting, jumping castles, an animal nursery and Bulgy Bus rides. A Day Out With Thomas has become a regular event for visitors to Puffing Billy each autumn and spring, offering a wonderful opportunity for Thomas fans to get up close to their favourite fictional train. October and November might seem far away, but you best book in early if you want to ensure your kids get to experience this highly popular Melbourne family attraction. Cost Tickets $27.00 for adults and children (4 years and over) $15.00 for toddlers (1-3 years).